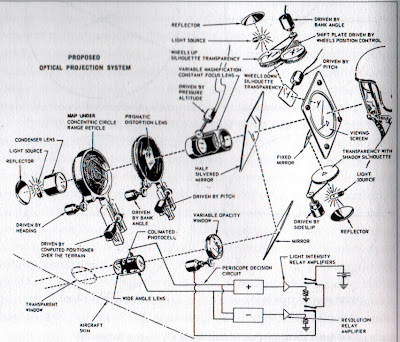 Schematic drawing of the Kinalog Display System, an early variant of the HUD (or "Head's-Up Display") commonly featured in military aircraft. From Branden Hookway, "Cockpit" in Beatriz Colomina, Annmarie Brennan, and Jeannie Kim, eds. Cold War Hothouses (New York: Princeton Architectural Press, 2004): 22-54. The two terms fiction and simulation are used to state a difference between the traditional arts and the technical media that is to challenge the concept of electronic "art". Whereas thmarts (in the terminology of Jacques Lacan's) have been operations in the symbolic producing some imaginary effects on a psychological level at best, the technical media (from the analogue media of the turn of the century to the computer as the universal discrete machine) for the first time employ symbolic procedures at a level concerned with reality and its unpredictability. Here simulation surpasses fiction. This unpredictability was first illustrated by the well-known Mandelbrot set, and the mathematician himself was surprised by the graphic results of his algorithm. (As if to demonstrate that after Turing mathematics is no longer the privilege of mathematicians.) It must be stated, however, that computer algorithms have not been developed to serve as graphic-aesthetic surprises, but in order to minimize strategic surprises by the enemy. This military concept of simulation developed during World War II permits retrospective strategic reformulation of aesthetic simulations (as with Richard Wagner, e. g.).